This gift guide comes from my lovely Southern roommate, Jessica. Jessica is a bonafied beauty and skin care expert, with hair like the girl from the shampoo commercials. I asked Jess to round up some fabulous presents for the girl in your life who has a thing for products. She went above and beyond and has below assembled an amazing array of gifts that will fit any budget - and are guaranteed to bring out the pretty in the beauty buff on your list. 1.Kai Body Buffer $40 - Kai is one of those timeless scents that just about everyone loves and luckily, everyone can wear. For these reasons, this line has a massive celebrity/cult following. The most unique product they have is their completely indulgent Kai infused sponges that cleanse, exfoliate, and moisturize the skin when activated by water. There are about 30 exhilarating uses in each one. 2.Birchbox ($10/month, $30 for 3 months, $60 for 6 months, and $110 for 12 months) - Think “Beauty of the Month Club”. Need I say more? Just in case I do, this exceptional service lets you gift monthly packages of 4-5 hand picked, deluxe, beauty product samples. Not only do I love when I come home to this little surprise on my doorstep, but I have found some of my favorite new products through this monthly delight! 4. St. Tropez Radiant Tan Set $40 - As a southerner, I appreciate a nice tan, and this tan-in-a-bottle is my answer to always wearing SPF 30 and never having set foot in a tanning bed during the winter. I especially like the gradual face tanner, because it helps cut down the reflection of my paleness in pictures. It's a great gift for everybody, because it’s easy-to-apply, streak-free, color-controlled, and doesn't have that bad tanner smell! 5. Cellure Stem Cell Skin Care System Set $599 - This is my creme de la creme. Yes, I work for them, no point in hiding that because it’s usually the first thing that comes out of my mouth when I meet someone new. Since I believe that all of mankind aged 25+ needs to start using this line, I will just describe it in one sentence: The first skin care line in the US to utilize adult human stem cell technology that is proven to not only prevent aging, but also to turn back the clock with its patented ingredient, Lipotein. Pretty futuristic, right? 6.Ted Gibson Beautiful Hold Hair Spray $19.95 - I am not a big hair spray fan, mostly because my hair is pretty manageable, but I am completely addicted to Beautiful Hold. Developed by my favorite hair stylist to the stars, the formula is so light and natural that it allows you to layer the product depending on styling needs. It also smells so great that I have people stop and ask me what perfume I am wearing. 7. Bond No. 9 The scent of Peace Now and Forever Pocket Spray $95.00 - This holiday scent can be purchased year round in all sizes, but I am partial to the pocket-size that comes in its own white leatherette pouch. Great for travel and a couple fresh spritzes throughout the day. Notes: Grapefruit, black currant, lily of the valley, musk. 8. SpaCell Facial Sponge 3 pack $28 - I use these little flexible fusion, bonded honeycomb facial sponges when I travel to wash my face and body, because I have a slight aversion to hotel wash clothes. They easily remove make-up and exfoliate your skin to make it squeaky clean. There is a soft side for more sensitive skin and a harder side for tougher skin or your body. It’s naturally anti-fungal, antibacterial, allergen free, and dries extremely fast. Plus, they come in so many vibrant colors! 9. Nordstrom Brush Set $29 - A chic pebble-grained case holds a complete range of ten full-size brushes. The high-quality set is crafted with aluminum ferrule and wooden handles and both natural and synthetic fibers. Set includes: a blush brush, contour brush, large eyeshadow brush, powder brush and smudger brush (goat hair), a concealer brush, eyeliner brush and lip brush (taklon fiber), a pony-hair round eyeliner brush and a nylon-fiber lash and brow groomer. Just a great deal all around! 10. A Consumer’s Dictionary of Cosmetic Ingredients, 7th Edition by Ruth Winter $15.98 - Everything you need to know about the safety and efficacy of cosmetics and cosmeceuticals. Is it a cosmetic? A drug? A nutrient? Take this non-biased book with you to every beauty counter to make sure you are purchasing products that are good for your skin. Education is key to treating your skin and you never know if that $200 anti-aging cream might have something in it that your skin won’t like. SUCH good picks, Jess! Love all of these! 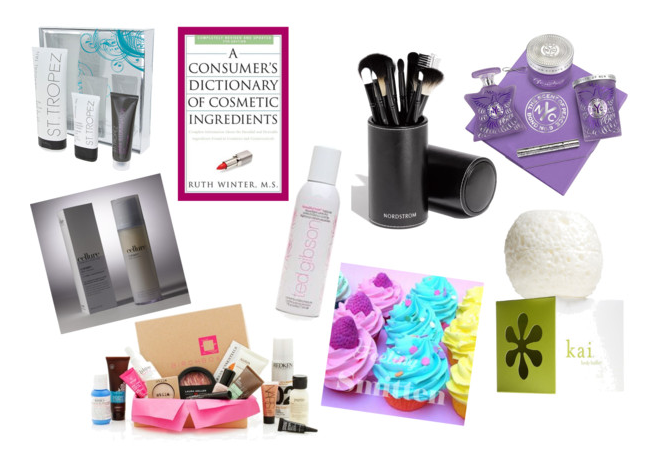 Great ideas, especially the consumer's guide to cosmetic ingredients. It's one of those things that would come in so handy but I would never think to buy for myself and I'm sure most people are in the same boat! Great guide! So obsessed with Birchbox, and LOVE St. Tropez :) So great that you are having your friends do this - I'm loving your guides so far! Interesting blog with simply amazing beauty products. Please keep sharing more and more information about beauty products and tips. Keep it up.